Tokyo-based composer and electronic musician (from Tetragrammaton, Jahiliyyah, etc.) presents a live hydrophone performance, manipulated and interspersed with underwater recordings and video made in Cambodia, Thailand and Japan. With visual constructions by Jamie Reed. 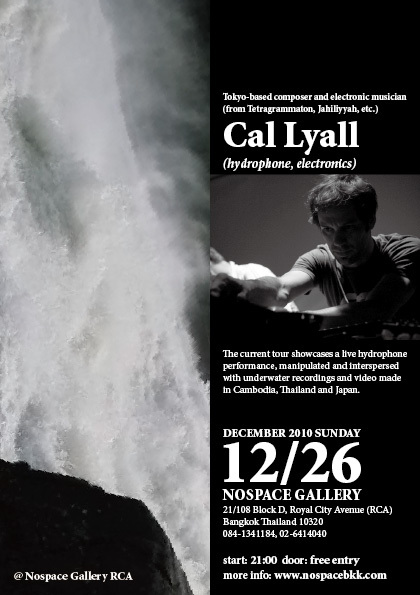 Cal Lyall (b. Montreal, Canada) is an improvising artist and electronic musician based in Tokyo, Japan. Constructing a musical universe from field recordings, stringed instruments, microphone systems and other electronic debris, his diverse contributions to numerous projects reflect a bevy of influences, ranging from traditional forms to free-flowing drone and ecstatic improvisation. Currently active in the drone-psych trio Tetragrammaton, ecstatic choral unit Jahiliyyah, and performs as a solo artist with a number of distinctive artists such as Tetuzi Akiyama, Chie Mukai, Government Alpha and Kelly Churko among others. Also heads up the Subvalent label and organizes the long-running Test Tone series at Super-Deluxe in Nishi-Azabu, Tokyo.